We finally made it to February and the first #CocktailFriday of the year on PBF! 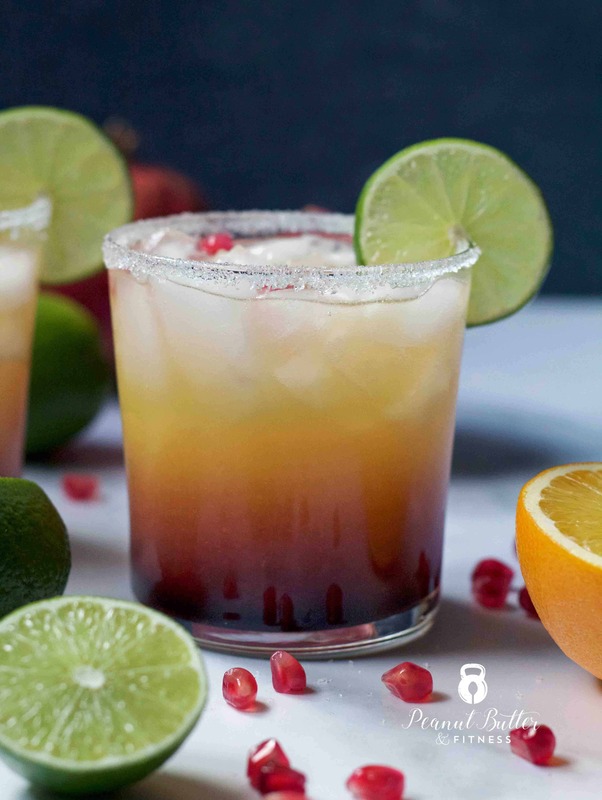 And here with us to break the “dry January” streak (if you had one) is the darker cousin of a tequila sunrise…the Pomegranate Sunset Margarita. Because it’s still winter and it still feels like the sun is setting uber early (*insert eyeroll here*). 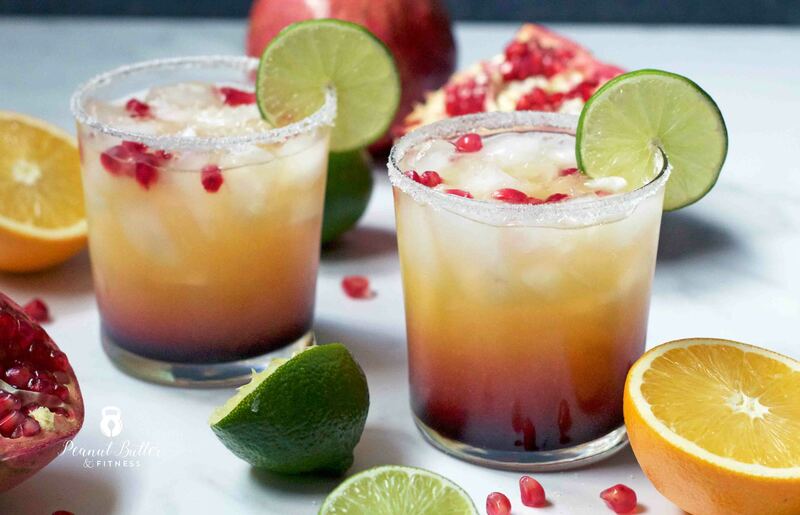 Tequila sunrises use grenadine, which is a super sweet pomegranate based syrup, to give them that signature bright red color at the base. 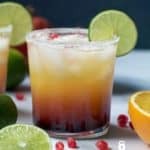 But instead of grenadine, I boiled down plain old pomegranate juice to concentrate the flavor and bring out that seriously deep, dark red color. Besides the swap out from grenadine to reduced pomegranate juice, this is still a different drink from a tequila sunrise. Namely, the addition of lime juice and triple sec to turn this drink into an unmistakeable margarita. 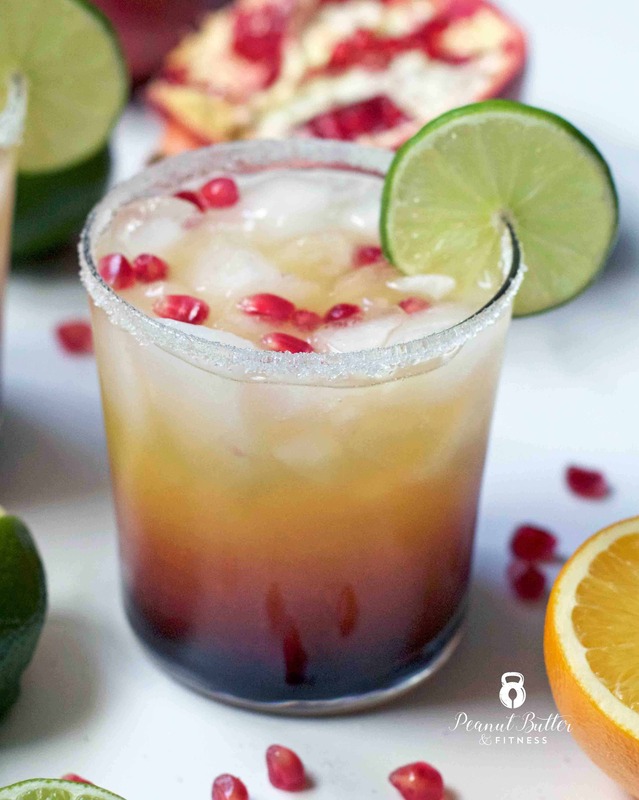 I love how the real pomegranate juice lends an undertone of deep sweetness that still maintains the tanginess of a classic margarita. In a small pan, bring pomegranate juice to a boil over medium heat. Continue to boil until liquid is reduced by half. Set aside to cool. If desired, rub the rims of 2 serving glasses with lime juice and dip in salt. Divide pomegranate syrup between the two glasses, then add crushed ice on top. Add ice, tequila, triple sec, orange juice, and lime juice to a shaker. Shake for 5-10 seconds until the shaker is frosted. To achieve the “ombre” effect, gently pour mixture over a spoon on top of the ice in the serving glasses. 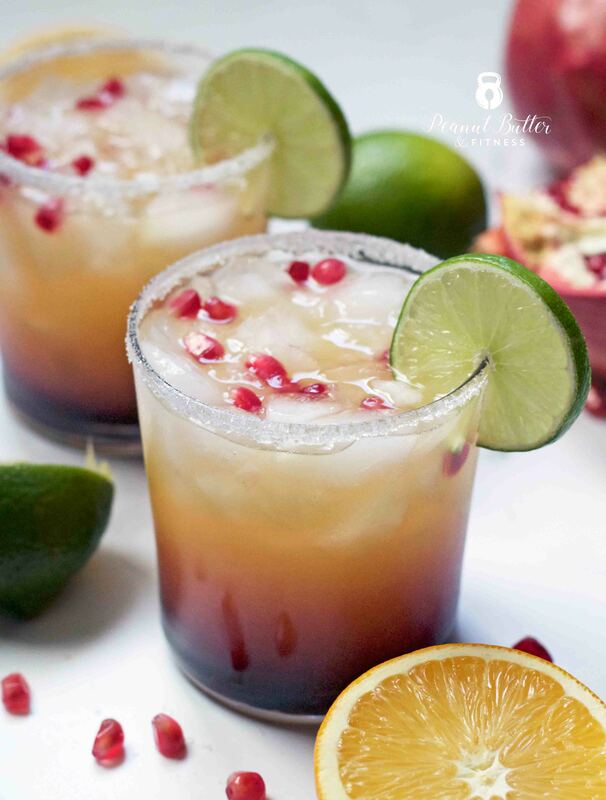 Garnish with lime and pomegranate arils before serving, if desired. For my macro trackers out there, I wasn’t able to create a My Fitness Pal barcode for this recipe since I would have had to decide for you whether to put the alcohol calories in as carbs or fats – that’s up to you! The 21 carbs listed here are just for the sugar in the juices and triple sec. For my non-macro trackers, here’s more info on what I’m talking about.